Are you looking for the best Mario Luigi plush toys? I hate it when I buy a figurine or plush toy and it falls apart instantly. Or it’s stitched weird and has colors that seem a little off. We all want the perfect toys for play or display. Looking great on the shelf as part of a collection or giving it as a gift to the biggest Mario fan you know. Instead of searching for hours to find the best ones, I’ve created a guide for my top picks of the best Mario Luigi plush toys for sale online. In a Hurry? They have all of the Mario Luigi plush sets right here! 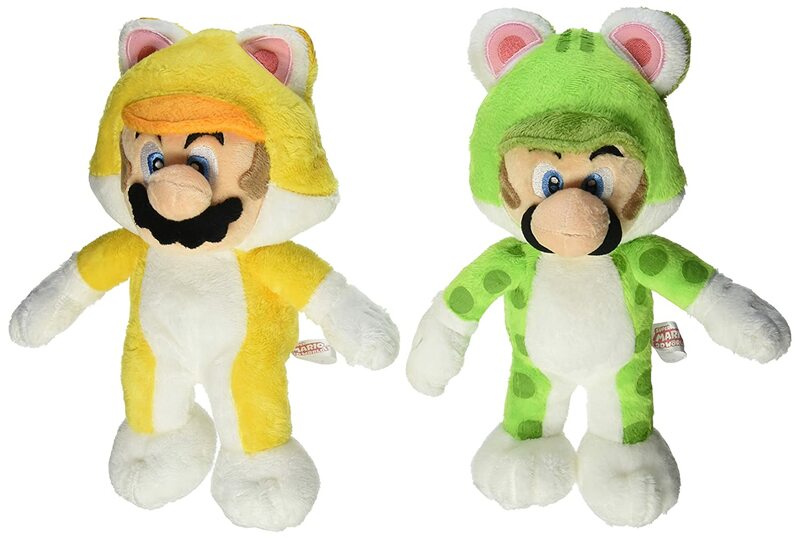 This first super mario plush set features the classic duo in their usual attire. 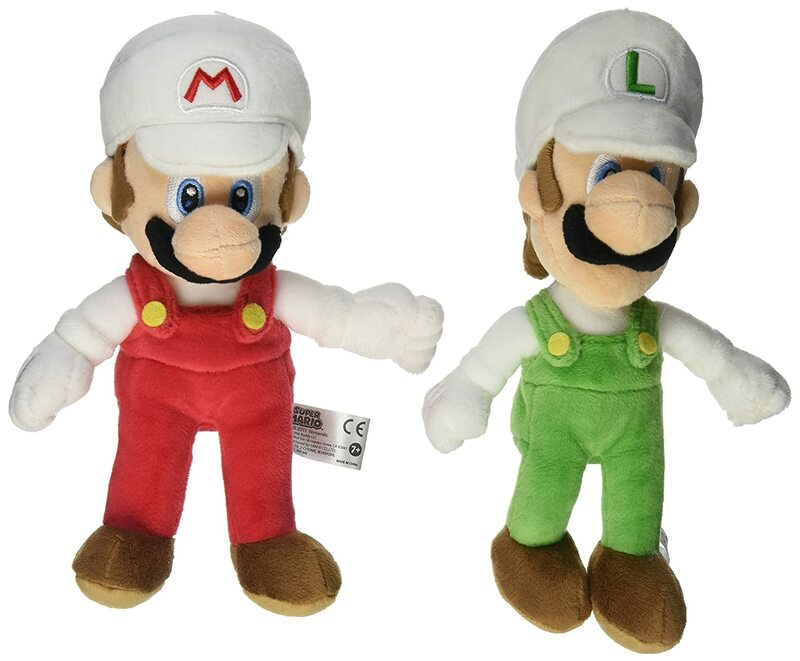 These are the original Mario Luigi plush toys. A great starting place for any collector or fan. Mario and Luigi are 8 inches tall which is a decent size. You know, not too big and not too small. There are larger ones available but, not in the same sizes for both Mario and Luigi. The Mario they have that is really big is 25 inches. The Luigi isn’t nearly that size even though Mario is the shorter brother. They are officially licensed plush toys by Little Buddy which is known for doing great plushies. Little Buddy and Sanei are the plush manufacturers that do officially licensed Nintendo plushies. These are very soft toys. That’s what we’re looking for in a plush. They are well made as well which is usually the case with officially licensed toys. How can you go wrong with classic Mario and Luigi gifts? What’s not to like? The classic colors not doing it for you? 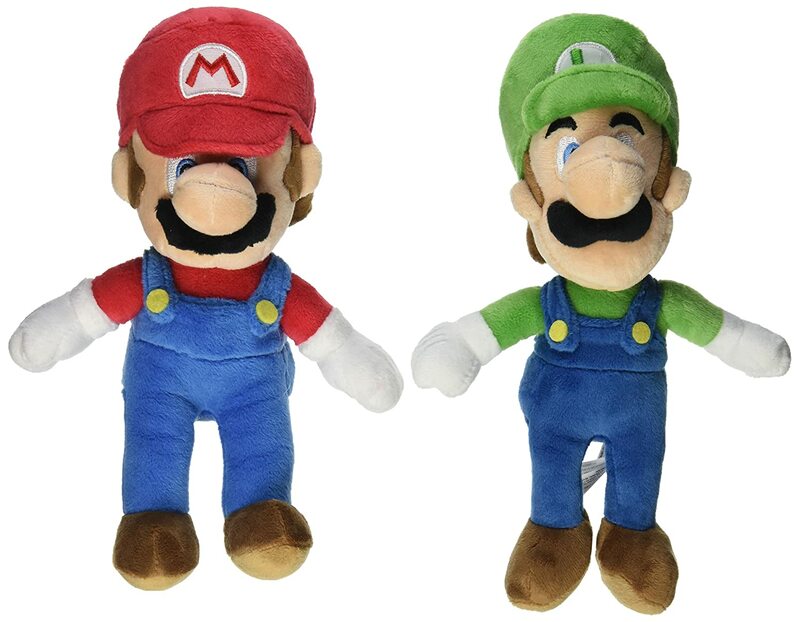 These are the Mario Luigi fire flower plush toys. They still hold onto their usual colors, red for Mario and green for Luigi. But, they have white sleeves and caps. With the fire flower power up both Mario and Luigi gain the power to shoot fireballs at their enemies. This is very helpful! But, you lose the power if you get hurt. I love having the option of color alterations on plushies and figurines. They look so nice as collectibles that way. 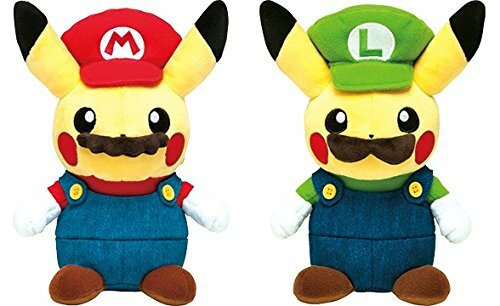 Mario and Luigi are both 8 inches tall, same as the plushies above. They are very soft and cuddly which is why they make excellent gifts for kids. Officially licensed plush toys by Little Buddy. This way you know they are made with care. Fire flower Mario and Luigi are very durable and well made. They are very good quality plush toys. I highly recommend them. They are both super cute plushies. Mario and Luigi, in general, are cute characters. They have big eyes and are always sporting a big smile. Great Super Mario toys for kids. 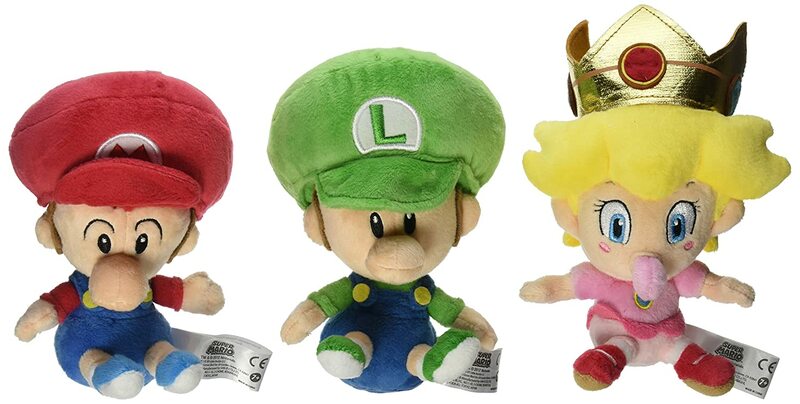 The Baby Mario, Baby Luigi, and Baby Peach plushies are great. If you grab yourself a Yoshi plush you can have a full on adventure just like in Super Mario World 2. Where Yoshi takes baby Mario on quite the journey. All three are 5 inches tall. It’s understandable that they are smaller in size since they are babies. It just doesn’t make sense that they would be as tall as the adult Mario and Luigi toys. Once again these three are officially licensed which means great quality. They are very cute baby plushies. This set is a great price for all three toys. In fact, it works out to be a great deal. Very inexpensive and affordable. Wonderful Mario gifts for kids. 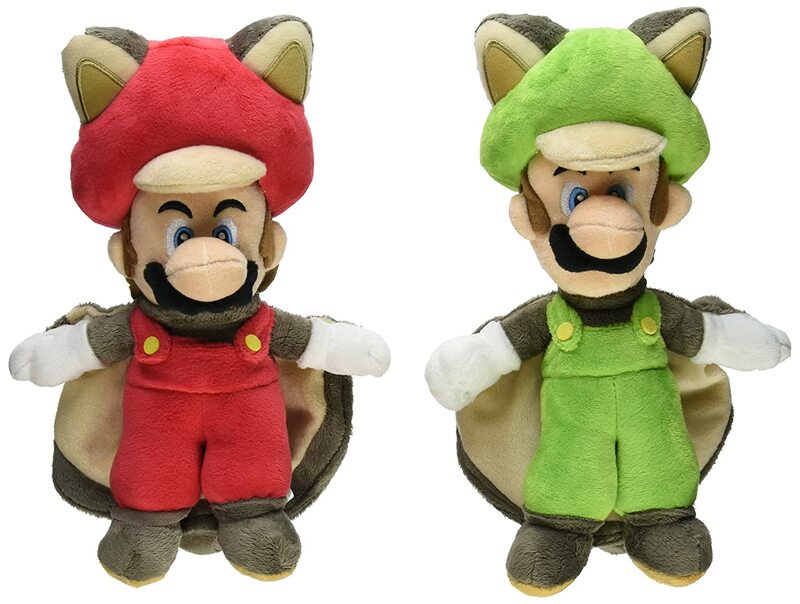 The flying squirrel Mario Luigi plush toys are cute as can be. The two of these are 9″ tall. The tallest of the ones we’ve seen so far! It must be the fancy hats and squirrel ears. 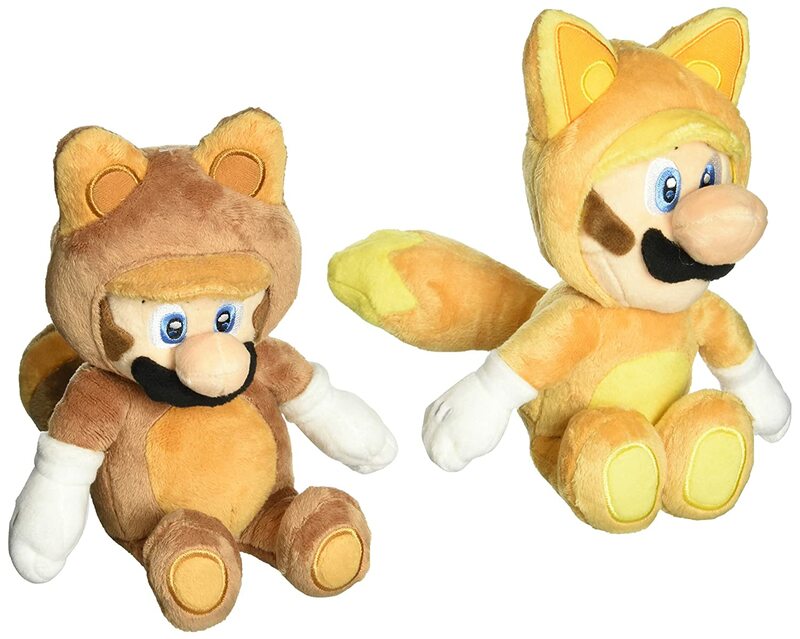 Officially licensed by Nintendo as per usual in the plush toys we’ve taken a look at. Very soft and squishable toys. Excellent for plushies. Definitely wonderful for cuddling. I love how cute the squirrel costumes are. They have the nice ears on top, the fancy capes for gliding, and a nice little tail in the back. This is actually one of the only Mario toys that have a turtle neck as part of the costume. I think that’s pretty neat. It’s an interesting part of their costume design. The Squirrel costume lets you glide and climb walls in the new Mario games. A very fun power up! In the Mario games, Mario gets the Tanooki/raccoon suit and Luigi’s is the Kitsune/fox suit. They are officially licensed, so, of course, they come well made. I think these are awesome super Mario gifts for kids. They both have cute tails as part of their costumes. These are very cute toys in general. Tanooki Mario and Kitsune Luigi are 9″ tall in height. Not too super huge. Great for collecting. They are made with high-quality materials so they are very durable. The Tanooki suit was always one of my favorite power ups when I played the Mario games as a kid. These two are perfect for Mario and Luigi fans and collectors. I know it may sort of seem like you can take off the hoods for these toys but, you can’t remove the suit. They wanted to make sure that it looked like they were wearing a suit just like in the games. Who could forget Cat Mario and Cat Luigi? Cute and very soft. They better be. They’re cats! I think the cat ears and tails are adorable. Plenty of details with paws being pink and they both have cat tails. Those cute ears too! Also, there are neat designs on them. Spots on Luigi and a nice design on the back of Mario. They are both 9″ tall which has become the standard so far here. Not super huge but, a good size for plushies. The suits don’t come off. You can peek inside the suits slightly. It shows that on the character they are actually just wearing a suit. You know, there’s a person in there. But, you still can’t actually take it off of them. The cats here are officially licensed by Sanei. So they are great quality, well made plush toys. Pikachu Mario and Pikachu Luigi. I just thought I’d throw these guys in for fun since they aren’t actually Mario or Luigi. Super cute. Pikachu’s design is already adorable but, just adding on mustaches and the hats make them so much better. These two plushies are limited edition toys. They are very rare and in high demand. So, they can be very tough to get. Even so, the cuteness rating is so high I think it’s totally worth it. They are both made of high-quality materials so they are very durable and nice. Awesome crossover of great characters. They are about 8 inches tall. Again, not too massive but, they are great for collecting and play. We all know that plushies can be tough to track down, especially the popular ones. Everybody loves them. That’s why all of the plushies I’m mentioning today are also being sold separately on Amazon in addition to the bundles featured here. So if you can’t find the set, you will definitely be able to find them individually. There are so many other great Mario series character plushies besides just Mario and Luigi. There’s Princess Peach, Toad, Waluigi, Wario, Yoshi, Rosalina, Princess Daisy, Bowser, and plenty of other cool characters. Check out my Mario character plush toy list. Is Luigi your favorite instead of that goody two shoes Mario? Then you’ll want to look at some of the coolest Luigi specific toys. Both plushies and figurines. Take a look here! There are also a lot of awesome Mario figures that aren’t plushies. You may want to check out my review for some of the best Mario figures. These are super cute! My kids have 89,000 stuffies. OK, maybe an exaggeration, but not by much! But I bet they would love to add these to the family.